SETH’S PICK :: HAWKEYE HC VOL. 1: It’s true, I’m writing about Hawkeye again, but for good reason. This week you can pick up a large format hardcover collecting the first eleven issues of the acclaimed series. There are several reasons why I think this is a worthwhile idea. First is the oversized format, which allows you to enjoy David Aja’s work on a larger scale. 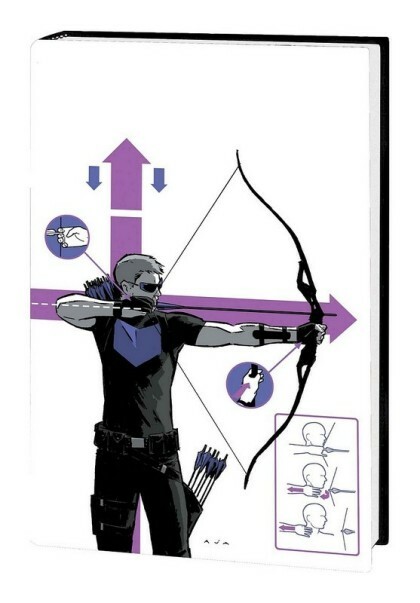 Secondly, you get all of Matt Fraction’s best Hawkeye stories (Pizza Dog, Hurricane Sandy) in a single volume. And thirdly, this is a mainstream comic that manages to not only deserve all its critical acclaim, but still understand the importance of being entertaining. After writing about this book for this blog several times in the past year, moderating the Hawkeye panel at this past year’s Heroes Convention, and talking about the title’s merits to anyone who would listen, maybe it’s time I stopped my unabashed promotion of it. Then again, it’s hard to not write or talk about good comics. Ultimately, this hardcover is an expansive way to enjoy one of the year’s best series. ← HEROESCON 2014 :: GUEST LIST UPDATE :: ESAD RIBIC & MORE!